Y.G. 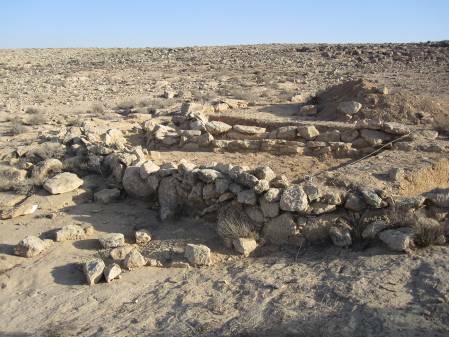 Contract Archaeology carried out this large-scale survey and excavation in the central Negev in 2009, coordinating with the Israel Antiquities Authority, the Nature and Parks Authority, and the Ministry of Defense. The area of Nahal Hava is at high altitude (750m) on the eastern fringes of the Mishor Haruhot. Prior to our investigations, the corpus of knowledge regarding this area’s archaeological remains amounted to several Byzantine Period (330-638 CE) agricultural terraces. The current project discovered sites dating from the Pre-Pottery Neolithic (ca.7500-6000 BCE) to modern times, and representing a broad range of cultural activity. A number of undated enclosures (Sites 45, 53, 55) and simple buildings (Site 68) were found. Certain constructions – such as standing stones (‘stelae’) and stone circles (Sites 46, 49, 54, 72) – may have had more overtly ritual or symbolic significance. 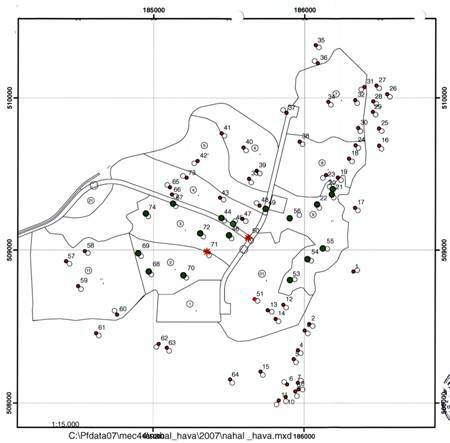 Other structures probably served a specifically mortuary purpose (Sites 44, 56). We also found recent cache sites in caves (Sites 20-22), undated granaries (Site 67), and stone clusters (Site 69, 70), some of which were most likely shiniyot (navigation aids). Most impressive and compelling were the complex water-cleaning and storage system (Site 71) and semi-permanent settlements from the Pre-Pottery Neolithic and Byzantine periods (Sites 50, 74), as well as one undated encampment (Site 72). A variety of activities were carried out at these larger sites, all of which merit further research.